Without changing macronutrient (carbohydrate, fat, protein) proportions of a diet, ie. even if keeping carbohydrate intake high, there’s still benefit from eating un-processed (“real / whole”) food. 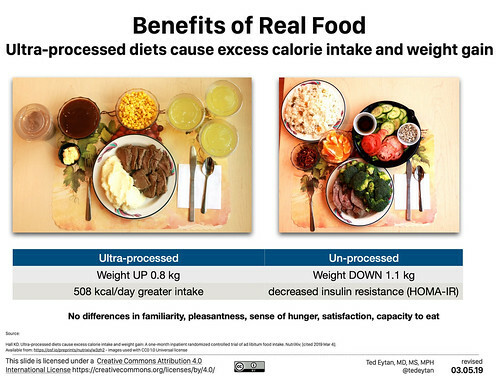 “Ultra-processed foods have been described as “formulations mostly of cheap industrial sources of dietary energy and nutrients plus additives, using a series of processes” and containing minimal whole foods (Monteiro et al., 2018)” and have never been studied in a randomized control trial compared to unprocessed (“real”) food. 20 non-diabetic adults were hospitalized for 4 weeks and fed ultra-processed and un-processed diets for 2 weeks each, and told to eat as much or as little as they wanted, over a 60 minute period. The paper’s first sentence starts with the phrase “diet-wars” which I feel is inaccurate and contributes to a lack of curiosity about science. We are not at war with our patients; we are at peace with them.